Future Interactions’ focuses on emerging technologies (communication technology, nanotechnology etc.) that enrich our everyday lives and asks how they can be embodied in a meaningful way. Design explores new horizons. How can design methods address promises and pitfalls of emerging technologies? How may these technologies transform our bodies, perceptions and behaviours? The workshop participants were split in teams of two people. We were first asked to select a couple of cardboard cards from a common pool, covering the main categories technologies, applications, and interactions. We chose these cards, as we believe the forever beta mode is the fundamental mode of the socio-technical design of society, involving all stakeholders as co-creators. That society is shaped by a working life in in which people are always learning from and with one another in networks and communities, without there being any stable knowledge hierarchies anymore. We added the political dimension, as we believe that such an informed, evolutionary, co-creative way of working & learning is not operating in a political vacuum, but should directly help shape the norms, values, and directions of the society of the future. We then discussed how these cards could be merged into a “future design scenario”. 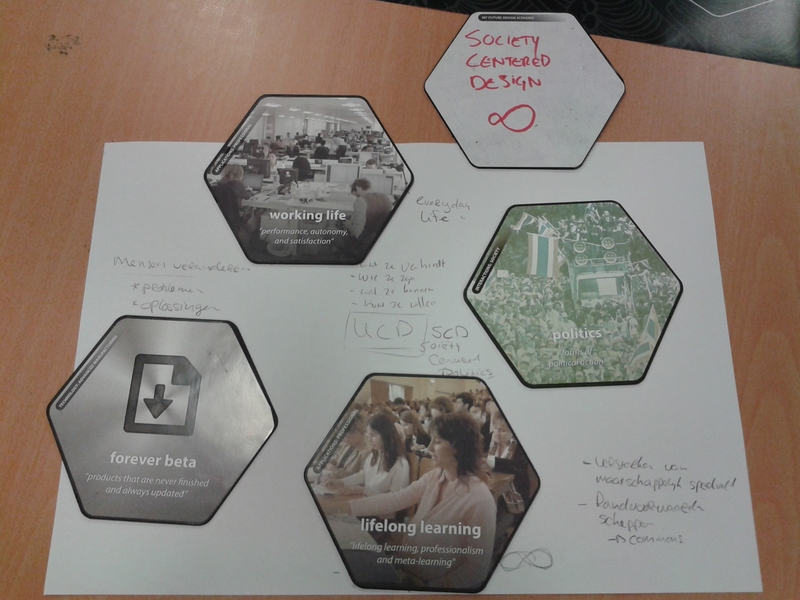 Discussing a concrete case about innovation of elderly care, and inspired by the software design approach of “user-centered design”, we arrived at the idea of “society-centered design“. Such a concept would require much more than currently often the case a holistic multi-stakeholder approach to emergent, knowledge-driven ways of working and learning. This approach should be governed by _and_ frame the political framework in which these productive learning processes ought to take place. An early example of such society-centered design are the increasingly popular multi-stakeholder “living labs” sprouting everywhere, in which working concepts and political governance models for complex societal issues like care and education are being co-created by – ideally – all stakeholders involved. 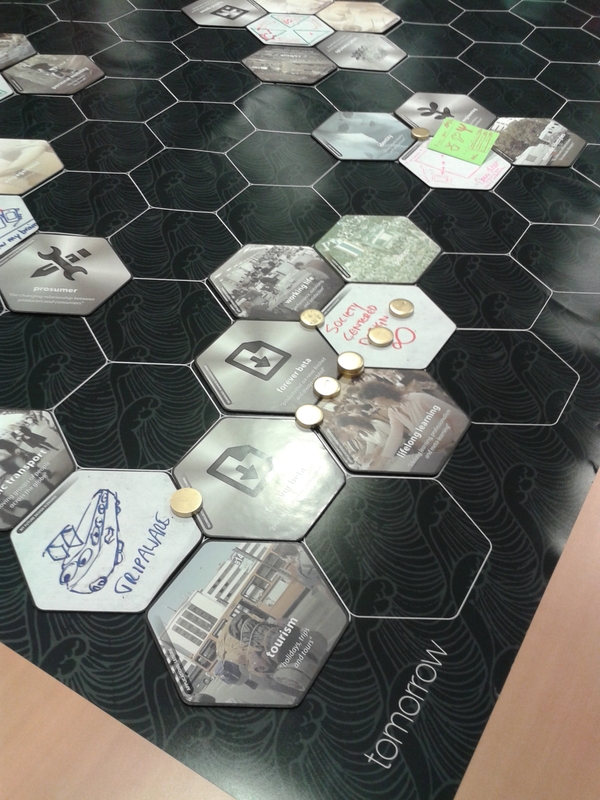 In the next step, all groups positioned their “draft concepts” on a large gameboard, the horizontal axis indicating how quickly a concept could be implemented (from “tomorrow” till the more distant future). Finally, each group made a 1-minute pitch for their concept, after which each participant could position a number of coins on the concepts (or their intersections) which they thought to be the most valuable and feasible (we were thrilled to see our “society-centered design”-concept to turn out to be one of the winners. We’re almost done with our accompanying future bestseller book 🙂 On a serious note: the popularity of this concept is another indicator that the time for the field of community informatics/communities & technologies has come, as they are all about societal sensemaking of the pros and cons of powerful (IC)Ts). The Future Interaction design method reminds me very much of other pattern-based design methods, such as the Liberating Voices “pattern language for communication revolution” (see Ken Gillgren’s piece on “lifting every voice” for a great application of that language). The beauty of such socio-technical design methods is on the one hand the simplicity of their components and rules, and on the other hand, the endless ways in which these elements can be configured and used for scalable, intricate human sensemaking. In the end, such methods are just catalysts, all the knowledge is in the heads of the participants. How to get that knowledge out of these heads and into socio-technical designs of politics, business, education, and every-day life & work is what such socio-technical sensemaking & design methods could help us accompish. How to build rich sets of concepts/patterns/cards that are generic enough to be multi-purpose yet specific enough to trigger creative use? How do such sets differ depending on their use, such as future interactions or “communication revolution” design? What rules of the game help (1) elicit the most powerful configurations of patterns and (2) make sense of what these configurations mean? How to document, share and disseminate the results? How to enrich physical workshop sessions with digital preparatory and follow-up work? How to make such insights actually influence policy-making and research?